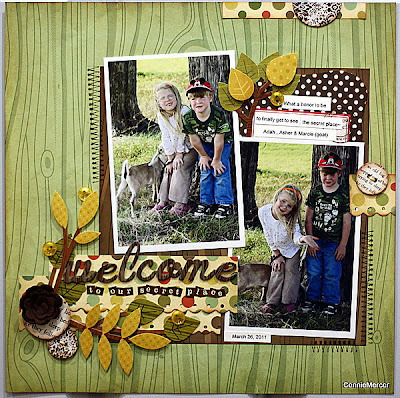 crafty goodies: Try it Tuesday~just for fun! Try it Tuesday is here!!! I had these awesome pictures of the grands showing me their secret place~talk about a proud moment, for them and me. I would rather scrap a feeling, a moment any day, because I remember how it made me feel when they said ~Nini, want to see our secret place? The pattern paper used is Cosmo Cricket/Mr. Campy . The stitching is put on with a Wendy Vecchi stitch stamp~awesome, no needle!!! I also used Jenni Bowlin chipboard buttons and real buttons!! The title is by Amercan Crafts. Love my thickers!!! and last~ look at that "welcoming gesture" ~ so sweet!!! If you find yourself with some extra time today~scrap a moment ~ it is the BEST!!! Tommorw I'll be giving a tour~hope you stop by!!! Beautiful layout, Connie. I love it! what a special moment, love the photos and I must get that stamp! What an honour and a beautiful page - love the papers and teh sd branches and stamping - gorgeous. Aren't grands just a wonderful blessing! I love your layout. I'm a big thickets fan myself. what an awesome layout and memory! so fun! how sweet of them to invite you to their "secret place"! That's a very special moment! I love when my nephews do things like that too and actually smile for the camera. I love your layout - very cool stiching stamp. It looks more real than some of the others I have seen. I will check it out! Connie! 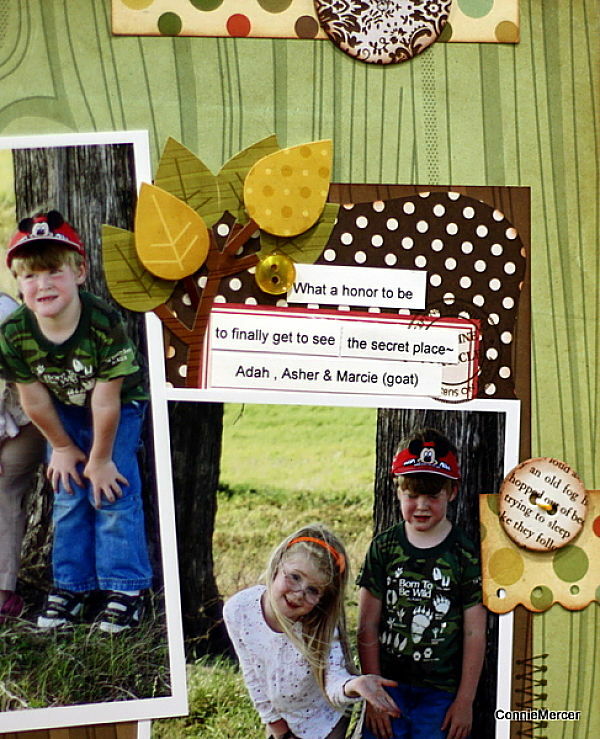 This is one of those pages that shows what scrapbooking is all about! just beautiful and so sweet!! Oh, they love their Nini! oooooooooooo this is so beautiful and elegant! lovely page - Mr Campy is one of my all time faves - it looks so good here! Gorgeous LO, I love the colours - I need to get myself those papers!! Awesome layout! Love the colors you used. What a lovely, lovely layout! I totally agree with you on scrapping a feeling. You could not have put this together any more perfect! What adorable photos for such an adorable moment and WOW on your paper choices and the really cute title.